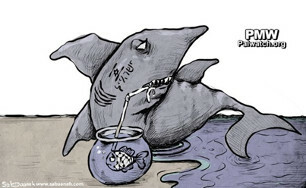 The cartoon shows a shark – with an Israeli flag on the side of its head and underneath it the word “Israel” written in Hebrew (with a typo) – sitting at the edge of the sea. The shark is drinking water through a straw from a fish bowl, while eying a small fish in the fishbowl that is looking back at it with an unhappy expression on its face. The fish’s body features the pattern of the keffiyeh (Arab headdress), symbolizing the Palestinians.